I'll admit it, I have Fall Fever really bad right now which is odd considering that it is still very warm outside, and I'm still mowing every week. That being said, typically by this time each year I have already started seeing color in the higher elevations in the Blue Ridge Mountains. In fact, it was around Sept 17th, last year when I went to Graveyard Fields and found all sorts of color. I've been keeping track online to see how the color is coming this year and it seems to be a good bit later due to the warm temperatures. Based on what I was seeing though, I decided that it was time to make a journey out to Graveyard Fields and see for myself how things were coming along. With my work schedule this week, I ended up having to take Friday off (Darn!) since I was working on Saturday. Looking at the weather, there was a pretty good chance of clouds throughout the morning and showers later in the day. 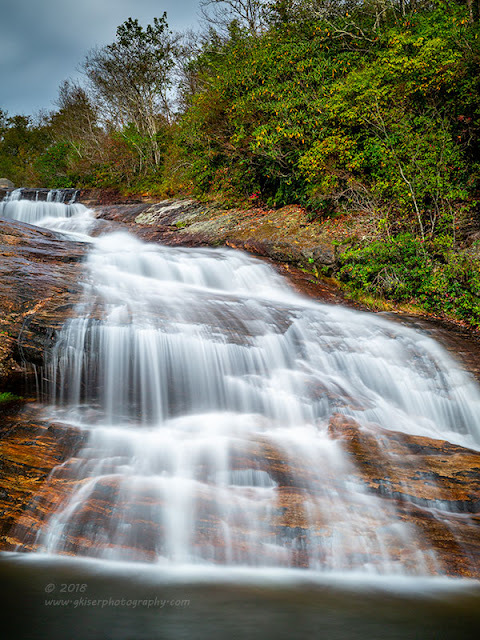 With some good rains recently, I figured that this would be a great time to see the Fall colors and to shoot some of the waterfalls at Graveyard Fields. I have yet to try the lower falls because when I have been there, the sun has been too bright to attempt waterfall photography. The forecast was showing some promise this time though. As an added benefit, the sunrise forecaster was calling for a good probability of some color in the sky as well. This was going to make for a really good trip if I could get a sunrise, and waterfalls in the same day, along with some bright colored leaves. I knew that it wasn't going to be anywhere near peak, but if I could just get a few trees here and there, I would be very happy with the first Autumn trek of the year. As is typical, I had to wake up pretty early to catch a sunrise. Oddly enough, the sun was rising after 7am at this point in the year and that makes it much more tolerable than the middle of Summer when the sun wakes up before 6am. However, Graveyard Fields is just a tick over three hours from home. Doing the math...carry the one...that meant that I was waking up at 3:30 and on the road by 4. I hate early mornings! My plan was to get on the Parkway in time to find a place to set up for the sunrise, which shouldn't be a problem considering I was looking at arriving around 6:15 or so. The trip out there was interesting. I left in the rain, and had clouds and fog most of the way to the lower section of the Blue Ridge Parkway. I wasn't sure how sunrise would look, but I was sure going to be in good shape for waterfalls. In fact, I even brought along directions to get to Estatoe Falls which is on my short list of waterfalls to visit. 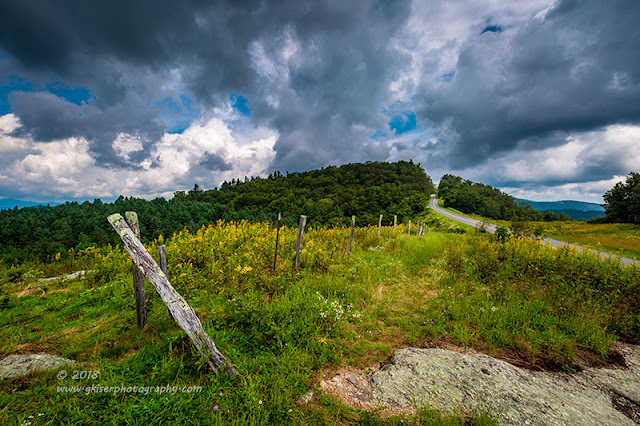 I figured that after shooting at Graveyard Fields, I could jump down the road to Estatoe and save the three hour drive I would have to make another day to shoot it. 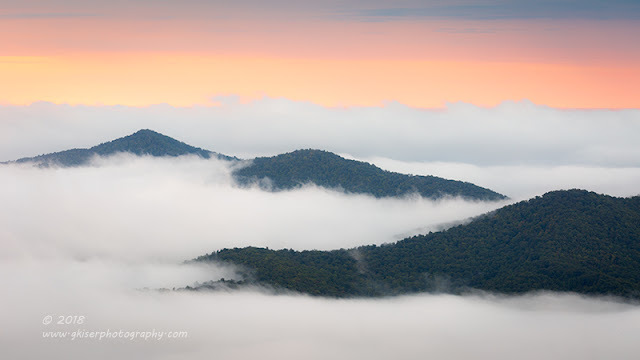 When I arrived on the Parkway, the fog was heavy and most of the overlooks were socked in. Not being very familiar with this section of the Parkway, I started hunting something that looked promising. The only problem was I couldn't see anything at all in the distance to know what to shoot. The sun was coming up too, and I was running out of time to find something. 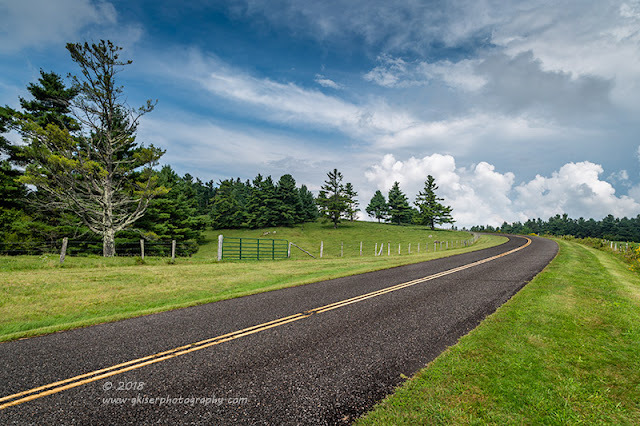 I started to drive by a long driveway that was marked "Mt Pisgah Parking" and thought about turning to see if that was an overlook. I remember thinking to myself, if I turn here, I won't have time to find anything else. If I stay straight, I don't know what I will find ahead. Essentially, it was a chance either way and I opted to make the turn and climb the short driveway. What I found at the top of the driveway was the Buck Springs Gap Overlook. It was positioned perfectly to see the sun, and there were some of the most awesome clouds down below. I pulled in and just parked the truck right on the edge, not wanting to be concerned with whether or not I was in a parking space. I got out and grabbed the camera. I set the tripod up and fitted my 70-200mm lens to the camera. I made a single exposure and found that I wasn't able to get the reach that I really wanted at this stage of the game so I added my 2X teleconverter to extend the reach. I was now able to shoot at 400mm which was just perfect to capture the clouds and the color in the sky. I was right in the nick of time to capture this as the colors were unfolding quickly in front of me. 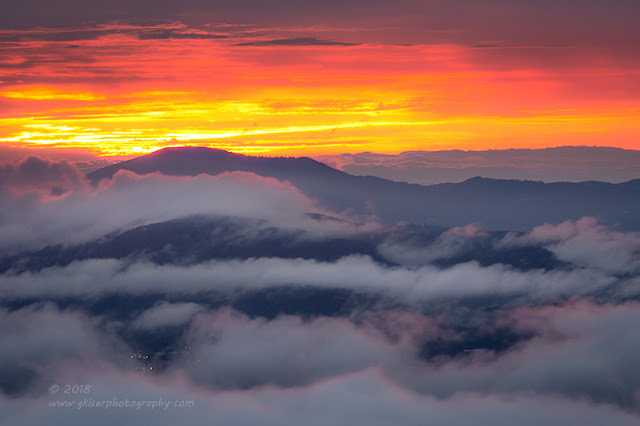 As the sky started to erupt in color, I removed the teleconverter and went back to my standard 70-200mm lens. I started looking at composition options and found that this was going to be a great prospect for a panorama. I flipped the camera on its side and got the tripod perfectly level. I did a dry sweep to check the exposure and set the focus. I then shot a 6 frame series across the horizon which I later stitched together for the opening image to this entry. I worked with other compositions and found some pretty good images over the course of about 30 minutes. In the end, I decided that I would pick the two best examples since they were largely of the same subject. 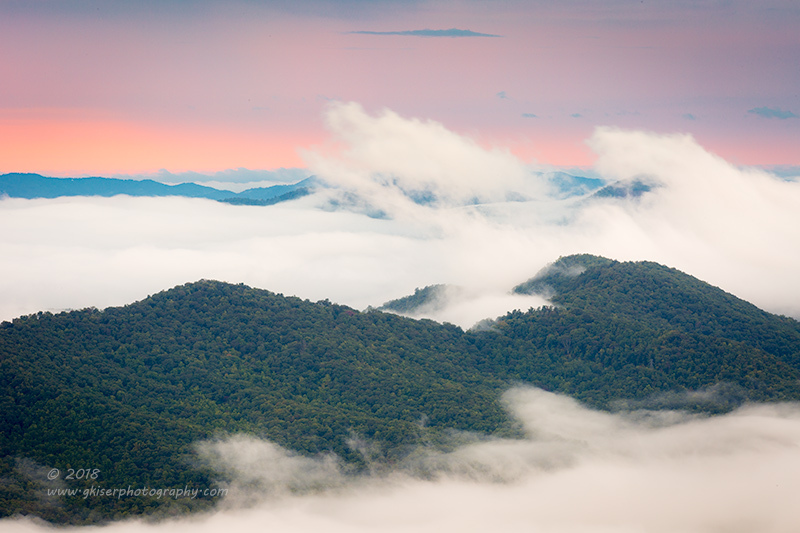 These are the two that I liked best from the sunrise at Mt Pisgah. After that series was done, I looked around to see what else was available. The sky was really nice, but I wasn't able to find any more workable compositions that excited me. I packed up my gear which actually took a minute. In my haste, I was throwing bits and pieces into the bag and not worrying about where they were landing. That meant that I had to move everything around to get it all back to where it was supposed to be. I considered shooting a short video here, but decided that the photography was more important than any video work. I still had a chance of getting some really cool skies if I found another vantage point to shoot from. I loaded the truck back up and started back out on the Parkway towards Graveyard Fields once again. I ended up passing Funnel Top and saw some really interesting clouds around the mountains. It was most definitely worth pulling over and setting the camera up again. This time, I was pretty sure that the 70-200mm would be the right one, and it turned out to be just that. With the conditions present, I still wasn't using any filters as the exposures were still very good. I started doing my isolation thing with the mountains in the clouds. This is always a lot of fun to do and it starts to take on an abstract quality really quick. My intention at this point was to shoot in black and white, but when I got home I realized that the color in the sky was pretty nice and worth leaving in. 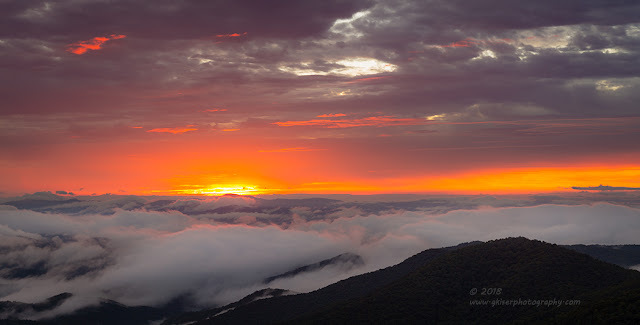 The clouds were really thick down in the valleys and the sun was still being diffused by the clouds to the East. This gave me very soft light and that was just what I wanted. I loved being able to render the textures in the mountains, and even the hint of green. These would have been absolutely gorgeous if the leaves were at peak with the colors in the sky complementing the Autumn colors, but alas, that was not the case. I'm not complaining because regardless of the colors present, these were a lot of fun to compose and shoot. As I was shooting, I realized that there were a few clouds that seemed to be arching into the sky. When I started looking, I realized that their shape was mimicking the mountains beneath them. This was a good enough reason to capture that scene. I had no problem isolating this phenomenon with the 70-200mm lens. The background mountains even lived up to the name of "Blue Ridge" in this light. Again, the color here was too good to pass up so I opted not to convert either of these images to black and white. I stuck around here about 20 minutes or so before I realized that I had shot all that I cared to from this location. The clouds were not changing significantly, so there were really no other compositions developing. I loaded up and hit the road once again, still bound for the Autumn colors of Graveyard Field. 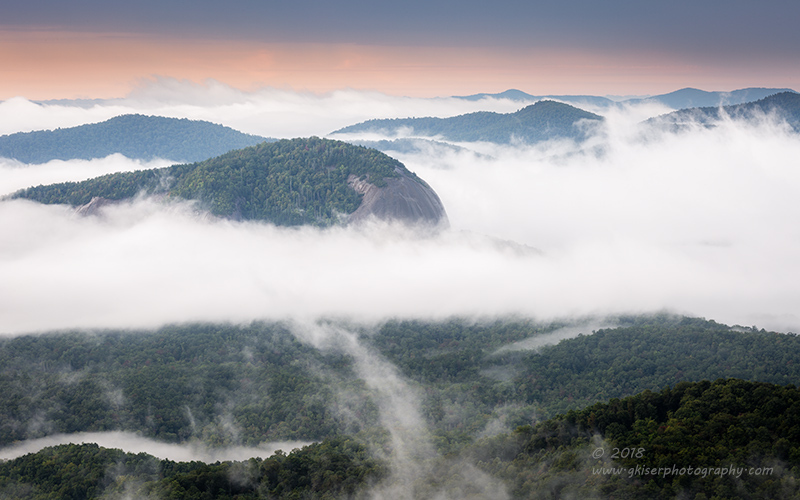 Not far down the road I passed by a well known landmark of the Blue Ridge Parkway, Looking Glass Rock. At first I wasn't going to shoot it, but when I saw how the clouds were looking around it I reconsidered. Once again I pulled out the 70-200mm lens and left any filters off of it. I worked on a few different compositions here before I found the one that I liked. There are repeating patterns of waves from the foreground into the background. The big interruption is the large bank of clouds with Looking Glass peeking out above it. The subtle hues in the sky rounded the image out, and I really liked how this one panned out overall. While I shot about 10 frames here, I only decided to keep this one. the others were just variations on the theme and really didn't stand on their own compared to this one. It was now time to move on down the road for my ultimate destination. I was looking forward to seeing the Fall colors at Graveyard Fields. However, when I arrived, my hopes were dashed. 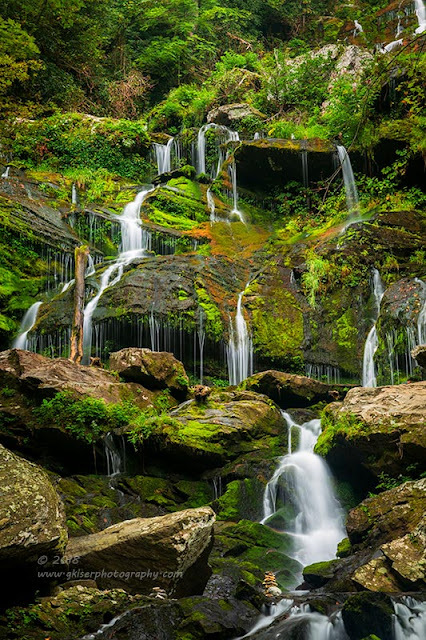 I could see the lower falls, or second falls from the Parkway and they were shrouded in green. They were also fully lit by the sun which had found its way into a large expanse of empty sky. The entire landscape mirrored what I was seeing at the falls with nothing but green present. I was disappointed to say the least because I was really hoping to see something similar to what I had seen last year, over a week earlier. Oh well, I was here and had driven a long way for this specific spot. I grabbed my gear and started off into the trails. As I was hiking through I could see where some of the trees I had expected to be in full color were now bare. It appeared as though those same trees had changed and then shed their leaves quickly. This would explain why I had been seeing pictures on Facebook showing some fair color in the area. I was too late for that, and too early for the majority of the leaves. I decided to skip the leaves this time and focus on the waterfalls. Yes, I know they were fully in the sunlight and that is a bad thing. My hope was by the time I got into position that the sun would be hidden behind the clouds. I was happy to find that the first little cascade by the boardwalk was in shadow. I had shot this last year with some color on the trees, but this year everything was totally green. I decided to give it a shot and I fitted my 24-70mm lens with the Singh-Ray Color Combo Polarizer before looking for a composition. I found a few workable compositions, but the lack of color left them rather flat and lifeless. The lighting was also not the best with some highlights in the background from the sun. After about a half dozen shots I decided that this wasn't going to work for me. I packed the camera back up and continued on to the lower falls. Having never been here before, I wasn't exactly sure what to expect as far as terrain. I knew what pictures were possible, but not exactly what was needed to get those pictures. After I made it down the steps, I came face to face with a rock garden like I have never seen before. The boulders were stacked up too high to get a good composition from where I was at. My only option was to find a way to rock hop to a location somewhere on the top of that pile. Fortunately I did have my waterfall boots on so some shallow wading was possible. The problem was the water was deeper than the boots were tall. I did manage to find my way around and over the boulders. My final location was interesting to say the least. I was standing on a rock, and there were three other rocks where I was able to place my tripod legs. I had very little wiggle room, and the camera was pretty much where it was with no movement possible. As you can see, I made use of what I had to the fullest. 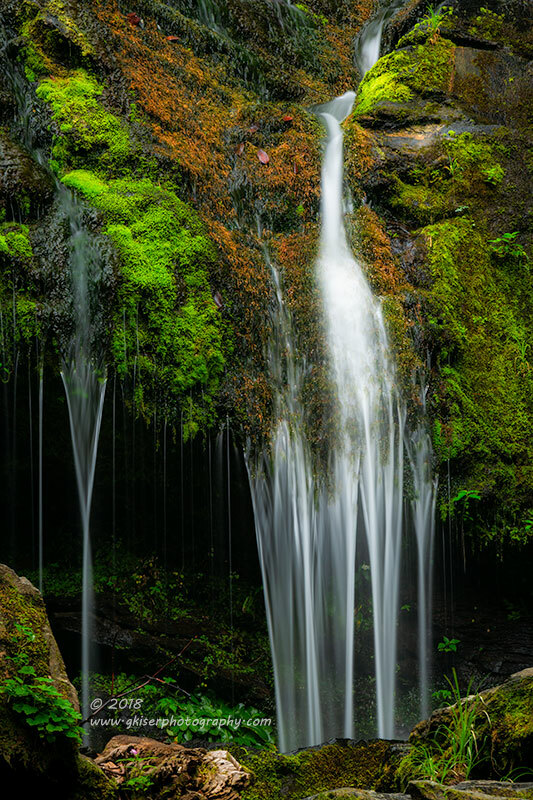 I started out with my 16-35mm lens along with the Singh-Ray Color Combo Polarizer, but quickly realized that that was just too much for this waterfall. I didn't like the compositions that I was getting and it was including too much of the foreground for my tastes. I swapped it out with my 24-70mm lens with the polarizer and found that focal length to work much better. My problem was the sun was still bright and causing my problems. The problems weren't my usual ones though with highlights and deep shadows. This waterfall is situated perfectly for a sunny shot as there are no shadows to contend with and everything is evenly lit. My problem was I was having a really hard time getting a slow shutter speed with just the polarizer. I knew I was going to need to add an ND filter to reduce the light and I have one for just this purpose. 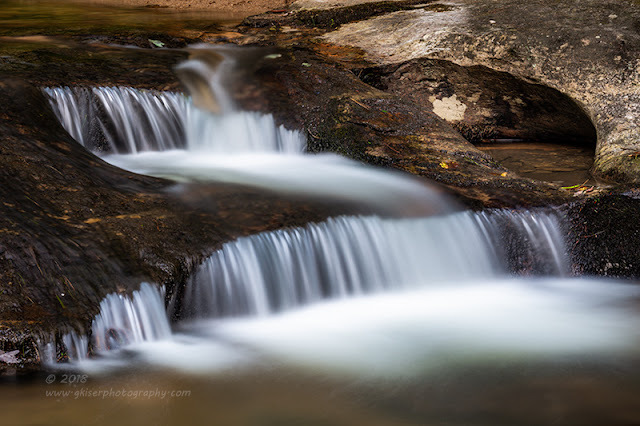 However, I was recalling my recent shot with Elk River Falls where I used the 10-Stop ND to get a three minute exposure. I figured that with the bright light here, I might actually be onto something with that kind of light reduction. I went ahead and added the lee Filter Holder to the edge of the polarizer and slid in the Singh-Ray Mor Slo 10-Stop ND filter. The lighting was much brighter than at Elk River Falls, so I knew I wasn't going to get a three minute exposure, and really didn't want that. Actually, I was aiming for 30 seconds, and was able to get just that with this filter combination. 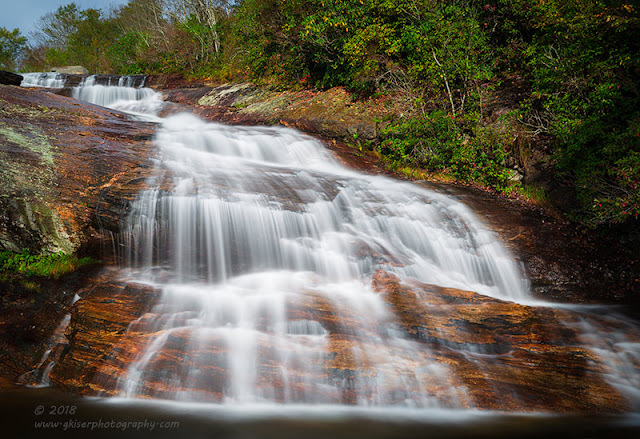 I shot several different compositions and exposures for this waterfall. I did everything from 1/5 of a second up to 30 seconds. I was actually surprised to find that I liked the results of the 30 second exposure best by far. The water flow was quick, but it was cascading beautifully so that it maintained detail throughout the falls. 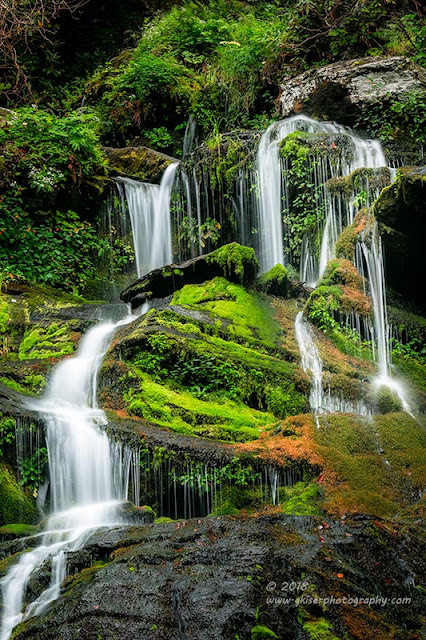 In the end, I decided that I liked a horizontal as well as vertical composition of this waterfall. I did shoot some isolations, but none of them really stood out to me, and I ended up trashing them. After this I was feeling pretty good about the day, but the clouds were clearing and it was not looking like Estatoe was going to be a possibility. Instead of giving that one a try, I decided to pack up and head home. I was getting sleepy anyway having been up for a very long time already. The sky was gorgeous all the way home, but the lighting was not quite good enough for photography. I think I made the right decision in calling it quits. I will get to Estatoe Falls eventually, but I do want it to be on a very cloudy day as I have in mind what I want to capture and sunlight really won't play a part in it. Saturday turned out to be completely sunny across the state and there was nothing that I could do with a camera, or at least nothing that I wanted to do. I decided to take my pictures to the Fair early in the day in the attempt to miss the football traffic from the Wake Forest game at noon. There was no such luck, I wasn't even able to get to the parking lot. I abandoned that hope and went home. I started to work on a Plan D or something like that. The weather was looking great for Sunday with clouds, showers, and even the potential for fog. That forecast was pretty much from home to the mountains. The trick here was, I needed to be able to get the pictures dropped off between noon and 4pm as that was the only time I could get them there. To avoid last minute problems I needed to aim for something around 2pm for a drop of time. That was going to cut my available outing time down to a minimum. With the weather looking gloomy I decided that waterfalls would be the best bet for the day. I didn't want to revisit one that I had shot before though, so I started to research other options. 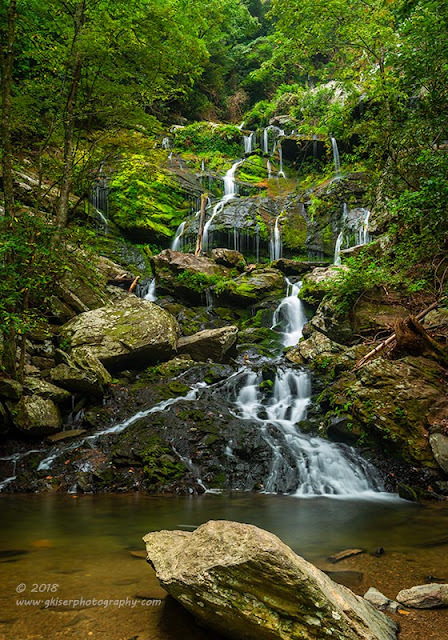 As I thumbed through the waterfalls in NC, I came across one that I had not seen before called Pot Branch Falls, which was located in Golden Valley, NC. It was about two hours away from me, and the hike seemed rather simple and quick based on the description. I was pretty sure that I could get there and have time to shoot it, and even have a little excess for another subject along the way. In order to give myself the most time, I decided to get up when Toni left for work at 5am. This would get me to the waterfall by first light and leave me with the majority of the morning to work it. I could tell when I left that it was cloudy, but not quite the full overcast I was expecting. As I went further West, I found myself under heavier clouds and even fog. This was going to be perfect! 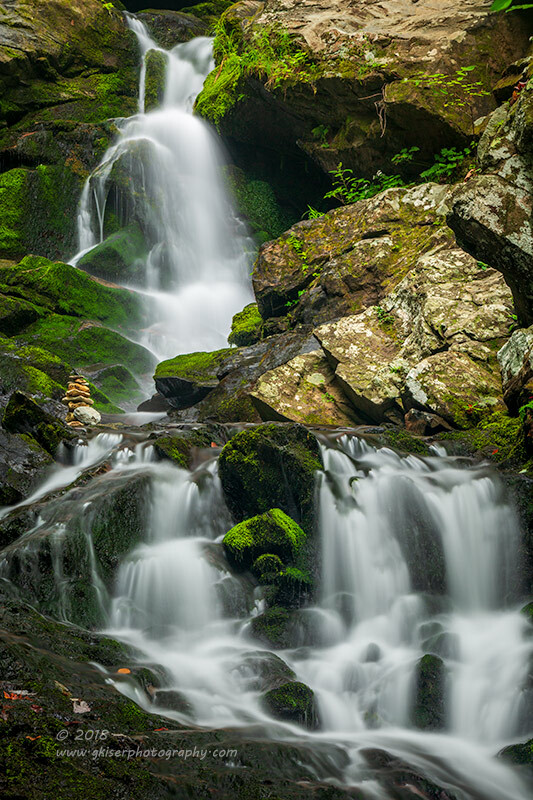 I was glad that I had opted to shoot waterfalls over Graveyard Fields since I would not have gotten the colors that I wanted in the dense fog. The excitement kept building as I came into Morganton, but started to fade when I saw the sky as the sun came up. There was some obvious blue up there, and the clouds were thinning out substantially. This was actually great conditions for doing the Autumn landscapes, but I was woefully out of position for doing that at this point. I opted to carry on and continue to my destination hoping that I would find something else along the way that was promising. With my hopes dashed a little bit, I did continue on and found a good bit of fog developing as I made my way through Morganton. I saw an old Ford N Series tractor on the side of the road that looked really nice in the fog, but I was wanting to capture this waterfall if the conditions held. I decided to wait on the tractor till the return trip. 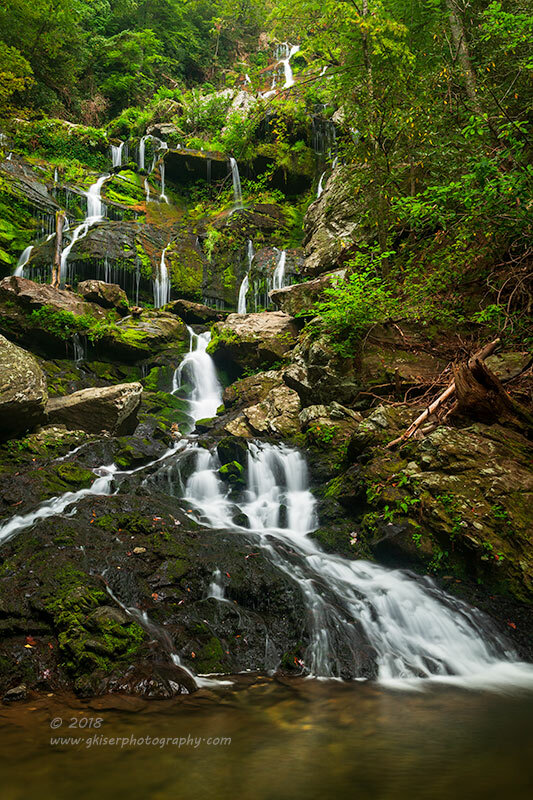 I was proceeding with a new found dedication to seeing Pot Branch Falls. It was short lived though. As I approached Jonestown Rd, the last paved road before the falls, the fog cleared as did the sky. Oh well, I was minutes away from my destination. The old service road was actually a great deal of fun to drive down for the 3 miles it took. There was even a small creek crossing to get to the falls. What I did notice was that the sun was hidden on the other side of the mountain, so that gave me a great deal of hope to have the waterfall in the shadows. When I finally arrived at the parking area the sky was pretty much bright blue with a few clouds here and there. I needed to hurry and take advantage of any shade that I could find. Fortunately the hike was quick and easy to navigate. When I arrived at the waterfall, it was indeed in the shadows which made me very happy. There were several sections to the waterfall and each had a different feel. What I was after was the long drop through the rocks that could be viewed from the bottom of the waterfall. It was a simple scramble to get down to the bottom, but there was a problem that I had not anticipated. There was a large tree that had fallen and was laying across the base of the waterfall blocking the view of the best part of this location. I tried to figure out a way around it, and even had a fleeting thought of trying to pull the tree out of the way. Don't worry, I didn't try as I know how heavy those things are, and knew I had no chance at relocating a tree. This was very unfortunate, and I had to regain my composure to figure out how I would shoot this waterfall. What I decided to do was to shoot isolations of the upper sections which were rather interesting on their own. For this, I decided to use my 24-70mm lens with a Singh-Ray Color Combo Polarizer attached. 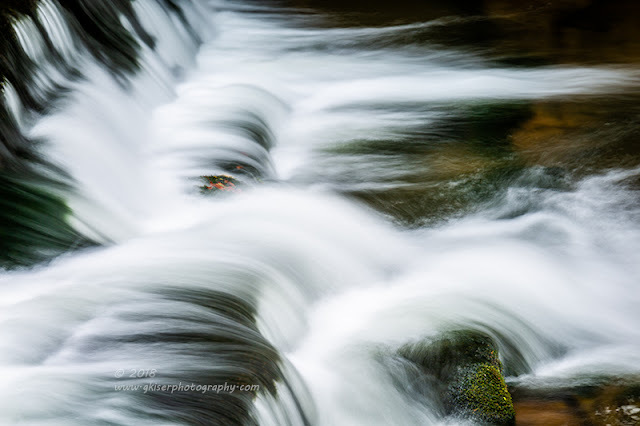 This gave me a lot of flexibility about how I captured the elements of the waterfall. I even used it to get a panoramic view of the top of the main drop (pictured above). I stitched together what amounted to five images in portrait orientation. I was standing almost on top of the water, and I was shooting at 24mm. I wasn't sure if it would work or not, but by carefully moving through the composition, I was pretty sure that I had the raw material needed to stitch it together the way I was envisioning it. After I played around with the 24-70mm lens for a while, I decided to bring out the 70-200mm for some real isolations. Of course, I kept the polarizer attached to the front element. I started to work isolations of the section just upstream of where I started. There was a few interesting little creek cascades with the eroded rocks I found so interesting. I even set up another panorama of this section (Eroded Steps) in order to capture a little different perspective. 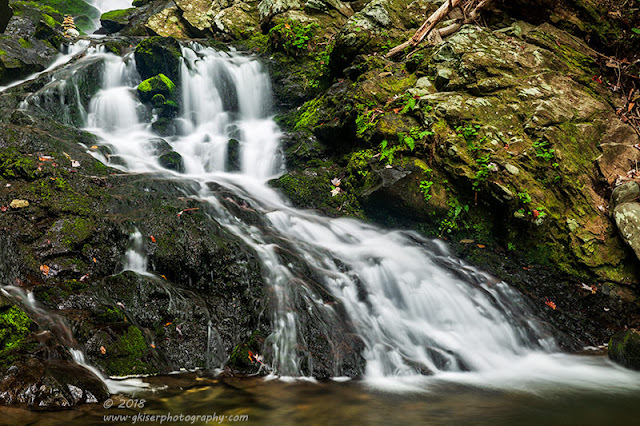 It took me about an hour's time to work this waterfall to the point that I was satisfied with my images. I was really surprised that the lighting remained really good for the duration of my time. I just wished I could have gotten the shot I was there to get. I will have to wait until the tree is no longer there to get that shot though. I did have a lot of isolation images of the different elements of the waterfall which was my secondary goal for coming to this waterfall. At least I was able to achieve that goal, and I shot a brand new (to me) waterfall. It would seem I am back to enjoying the thrill of exploring new waterfalls, and will likely continue that through the fall and winter when there are less people around on the trails. I made the hike back to the truck and made my way back out to the road headed to the house. I was looking for the old Ford tractor while enroute though. The only problem was the sky was pretty blue and the lighting was getting rather harsh. Oh well, it wouldn't be the end of the world if I missed out on the tractor. As it turned out, when I got to the tractor and really started to look at the setting, I decided that it was not quite the find that I had thought it was. It might have worked better in the fog, but currently, there was too much clutter around it to make it work as a photograph. I shrugged it off and continued down the road. As I was coming up on a gas station, I could see a rusty car off on the side of a neighboring field. I saw it in just enough time to hit the brakes and pull off on the side road which ran alongside the field. My eyes had not deceived me at all. 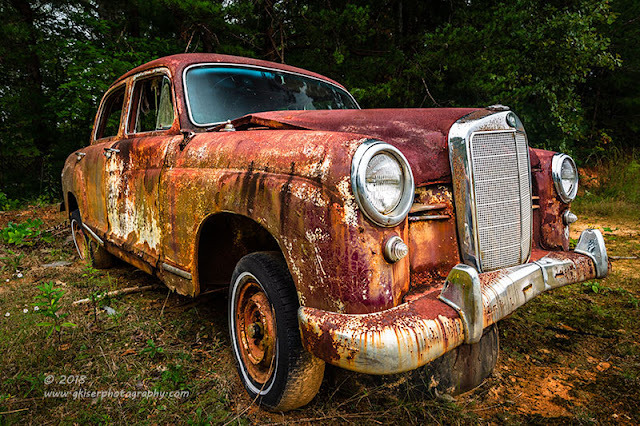 That glimpse of rust turned out to be an old Mercedes sitting next to tree line. The lighting was pretty good on it as I was coming back into the cloud cover. I looked around and didn't see any indications that there were trespass issues, and I saw no structures at the field where I might try to ask permission. Since I was totally in the open, I decided to take my chances and I pulled into the field and grabbed my camera with the 24-70mm lens attached. Of course, I added the Color Combo Polarizer to the front and got set up for my first exposures. There wasn't a lot to work with around the car, so my overall shots were dependent on things like the branches overhead to really make a cohesive composition. What I did like about this car was the bent hood and broken windows. The chrome bits were still there which was pretty awesome to me. The front end of this car really caught my attention as a matter of fact. After I did some overall shots of the car, I started to get in closer and work my way through the weeds to get some intimate shots of this old Benz. As I was setting up a shot off to the side, I decided to get low and have the headlight looking off to the side. With the composition I was able to get, I swear the car looked like it was pondering something pretty serious. That is what I love about headlights on these old cars, the personality and soul of the vehicle shines through. The patina of this car was amazing and the textures just jumped out at you at every angle. 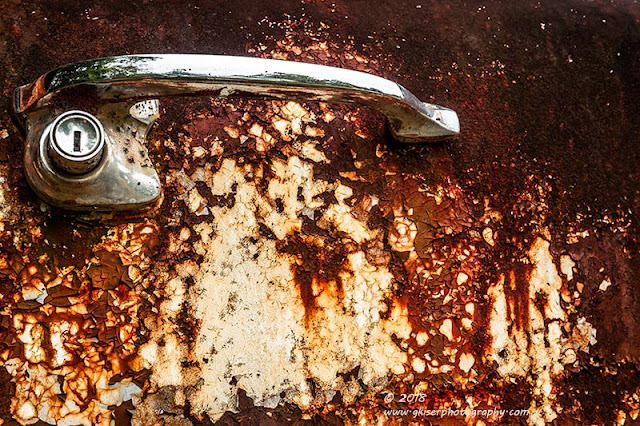 I started to look for ways to capitalize on the patina and found that the passenger side door had a great deal of character in the surface. I used the door handle to anchor the shot and got in really close to fully show off the old paint, scale, and rust. 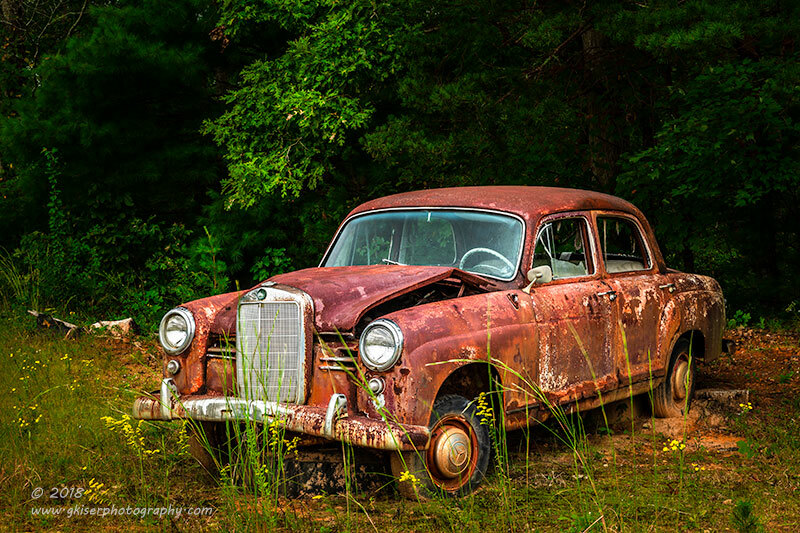 It has been much too long since I have shot a real rusty car and I have to say, I've missed it. 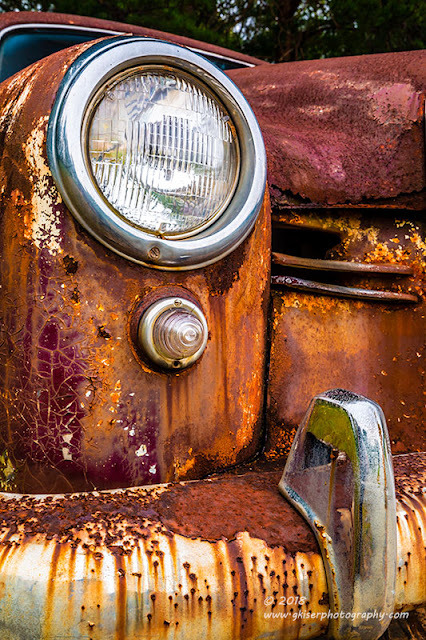 There is just so much that can be done with these old cars. After every shot I made of it, I was looking over my shoulder expecting my time to be cut short. Fortunately though, nobody seemed to car that I was here. I wasted no time, and kept working different compositions of the car, and even started to look inside for ideas. What I loved about the view from the passenger's door was the strands of headliner that were hanging loose from the ceiling. The window was mossed over, and there was obvious mold in the seats. 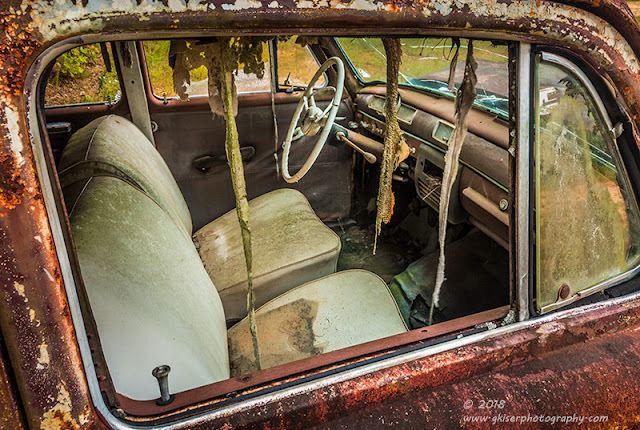 It just screamed age, but there was still a lot of recognizable features inside the cabin which told the story of the car. The rusty frame of the door kept your eyes centered on the interior which I liked as well. I tried a few different compositions here, and was really wanting to open the door, but I have a hard and fast rule that I shoot them as I find them unless I have an owner with me who allows opening doors and such. One thing that I couldn't get away from was the front end of this car. The fact that the chrome was mostly in place was amazing, and I loved the bumper and the grill. I thought about shooting a perfectly symmetrical composition here, and thought about a straight on, off centered view as well. In the end though, I decided to go off to the side and make a head light and the grill the main points of the photograph with the opposite headlight as a balance element, all linked together by the bumper. I wasn't sure how it would turn out, but after seeing it on the computer monitor I was happy I went this route. It is a little different than my normal shot, and suites this car all too well. Even though I had seen some success with an angled composition, I was still wanting to try something a little more intense from the front of this car. I got positioned right at "eye" level to the headlight and squared up with the front of the car to get this very dramatic view from the front of the car. 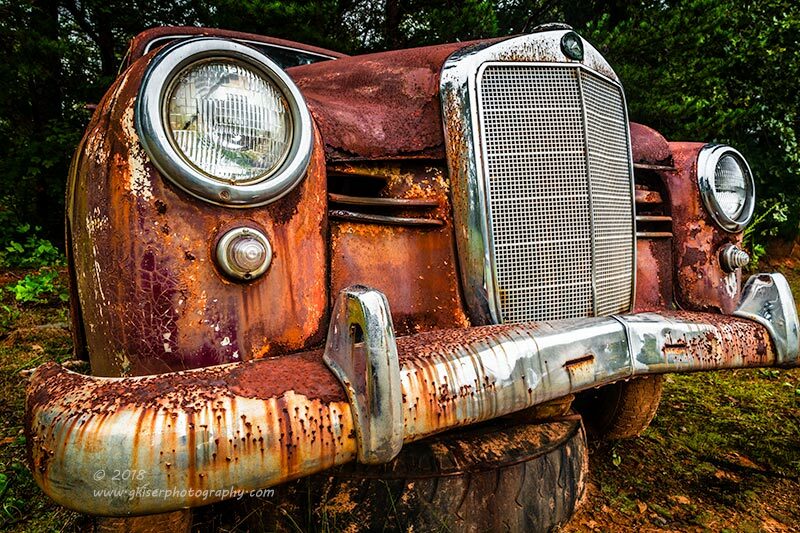 What I really liked about this view was the patina that turned into the background to the headlight and marker light. The slats under the hood were less than pristine, and the chrome surround made for a great framing element on the right side of this composition. 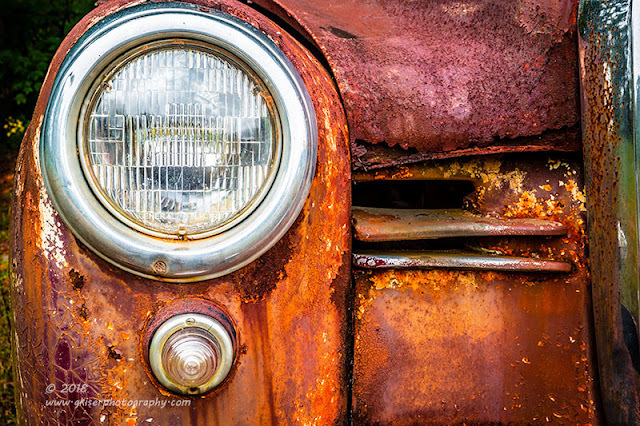 The fronts of these old cars really make for great abstract pieces. When all was said and done with this car, I had a total of 80 frames shot divided up very equally with 40 at the waterfall and another 40 at the Mercedes. It was a simple day with only two subjects in front of the camera, but considering the weather playing tricks on me and a fallen tree that blocked my view of the waterfall, I really can't complain. The day went pretty much as planned and I was able to drop my two pictures off at the Fair with plenty of time left to spare. I'll have more on those pictures in the next installment of my Behind the Camera feature around the first of the month. So, here I was on my last day in the mountains. The weather was cloudy and rainy. There had been some rain moving across the area over the last couple of days. That could only mean one thing.....it was time for waterfalls! To catch you up, I found myself on an unplanned trip to the mountains that was pretty much centered around the fact that I wanted to visit Catawba Falls on the suggestion of Michael Surratt. Looking ahead late last week the conditions were looking favorable for this waterfall on Sunday, and those conditions remained in tact. I stayed at the hotel long enough to grab some breakfast before checking out and heading towards old Fort, NC, where the falls were located. Along the way, I found a possible location for some old car photography along Hwy 221, and then again on Main St a few miles South of that. It was foggy and rainy, so I opted not to waste time scoping these locations out as it was too early to be knocking on doors to ask permission to be on the properties. I arrived at the falls about 8:30am and grabbed my gear and started out on the hike. I was a little surprised to see about a half dozen cars in the lot already, even though Michael had said to get there early to avoid the crowds. Regardless, I was here and I had time to work this waterfall before going home. The hike was a little longer than I expected as I hadn't really researched the distance. After about 30 minutes of hiking what seemed like constantly up a hill, I stopped and checked for internet connection on my phone. I was able to pull up the hiking information for the waterfall and found that it was about a mile and a half. based on my normal pace, that meant that I should be just about there. I continued on with the hike and started to climb some rocks. Just around the corner I found the waterfall. Had I waited about two minutes, I wouldn't have had to stop to check the phone. I was really happy to see that there was nobody at the base of the falls, so I was totally alone with it for the time being. I got the camera set up for an overall shot in case somebody decided to join me. For this, I started out with the 16-35mm lens along with my ever present Singh-Ray Color Combo Polarizer. This filter would stay attached throughout the day regardless of lens choice. My first shot used one of the rocks as a foreground interest to introduce the scene. The waterfall was rather impressive in sheer size, but there wasn't a ton of water running down the drops. What was there was really interesting and I was here for the isolations anyway. I had been more excited about that potential since the beginning. One of the features that I found early on that I really liked was a cairn situated near the base of the falls. 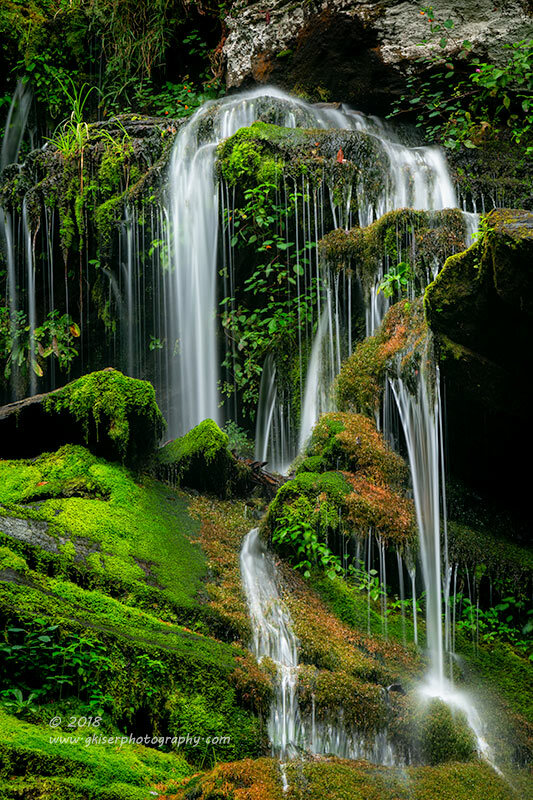 It was surrounded by some really nice cascades and that made for an interesting picture in my mind. For this, I was going to need a little more reach so I swapped lenses for my 70-200mm and started making compositions. I tried both landscape and portrait, but found that the tight portrait orientation seemed to work a little more effectively. That is not to say that the horizontal composition was lacking. It stood on its own right, but the cairn lost some of the visual importance. I was able to capture another cairn to the left that I had not been able to see when scoping out the falls at the scene. I actually only saw it when I was starting the editing process of the pictures. That is the benefit of a nice long lens, you can see details that are hidden from view many times. I really liked the way the rocks framed the single cascade in this composition, along with the moss on the rocks. While shooting isolations on this waterfall, I wanted to get some compositions up near the top. For that, I was going to need a bit extra reach. I grabbed my extender and mounted it between the lens and camera. That gave me the ability to reach out to 400mm to capture some of the smaller sections near the top of the falls. I liked this section a lot because of the two colors of moss on the rocks. The cascades were also quite interesting in their patterns. If you look closely, you can even see a number of small streams coming off of a ledge that links everything up at the base. 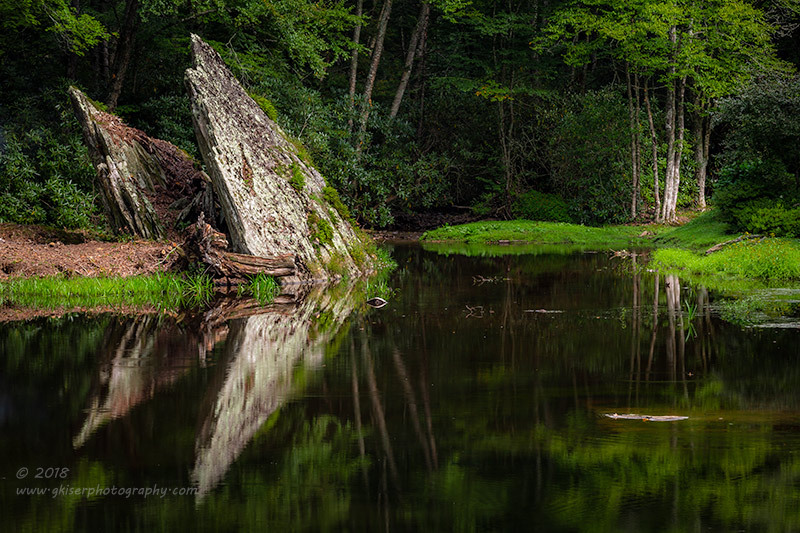 It was the moss that really made the compositions for me. I loved the shades of green and burnt orange. It was almost like Autumn colors at the end of Summer. I found a few areas that had interesting cascades, or like this picture, just a runoff from the ledge. It really is amazing to me how the terrain works with these waterfalls and in the mountains in general. Always so rugged and inhospitable, yet so beautiful and full of life. I was really having a lot of fun with the reach of the extender and kept finding more and more compositions. This turned out to be a really good thing because while I was shooting up at the top of the falls there were several groups of hikers that showed up and wanted to experience the waterfall. For many of these isolations, I was actually shooting over the heads of other hikers. They were all very respectful and made sure it was OK to enter into the scene. I don't think they quite understood what I was trying to capture as I could tell they were feeling awkward standing in front of the guy with the camera while actively making exposures. I really took this time to experiment with compositions. I found a lot of nice elements to include near the cascades like these berries to the upper left. They added another dimension in color as well as texture to the images. It was still the moss that captivated me for this section. 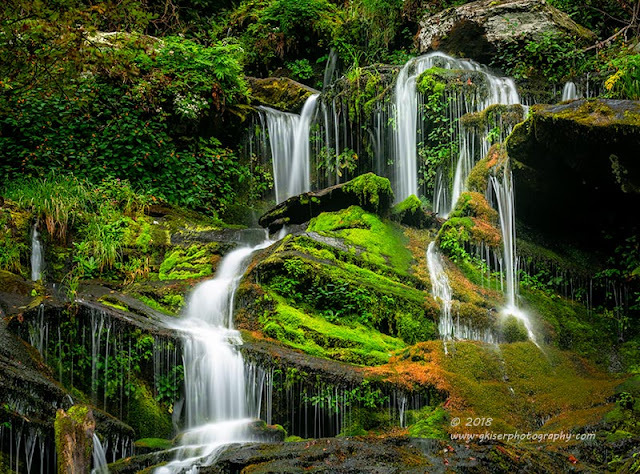 I loved the browning tones and it gave a richness to the image that is lost with solid green moss. As I had a break in hikers, I decided to try something a little different. I swapped lenses once again to my 24-70mm so I could get some midrange compositions of the cascades. I again turned my attention to the cairn that I had shot earlier. This time, I made it the base of the photograph with the larger cascade drawing your eye to it. 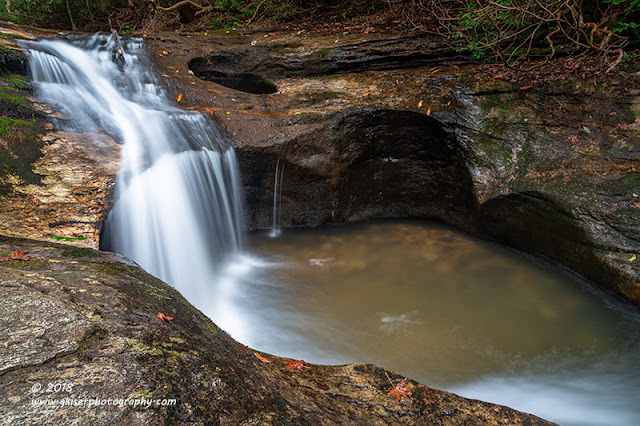 The smaller cascades provided visual interest and patterns through the rest of the image. I was able to include the different color mosses as well which was a great bonus. Catawba Falls is an interesting waterfall to photograph. It is hard to have it make complete sense in the overall view. The isolations are very interesting, but have a certain careless quality about them. Finding patterns and lines is a difficult task. I see that as a plus as it probably means that each photographer will pick out their personal favorite sections which will probably be different from the next one. I haven't seen a lot of pictures from this waterfall before, but I can say that it is a really nice one with a lot of potential. One technique I found that works well with this waterfall is focusing on a single side of it. By including both exit points, you start to lose the top and mid sections. What I did here was eliminated the left exit, and chose to focus my attention on the dominant exit to the right. 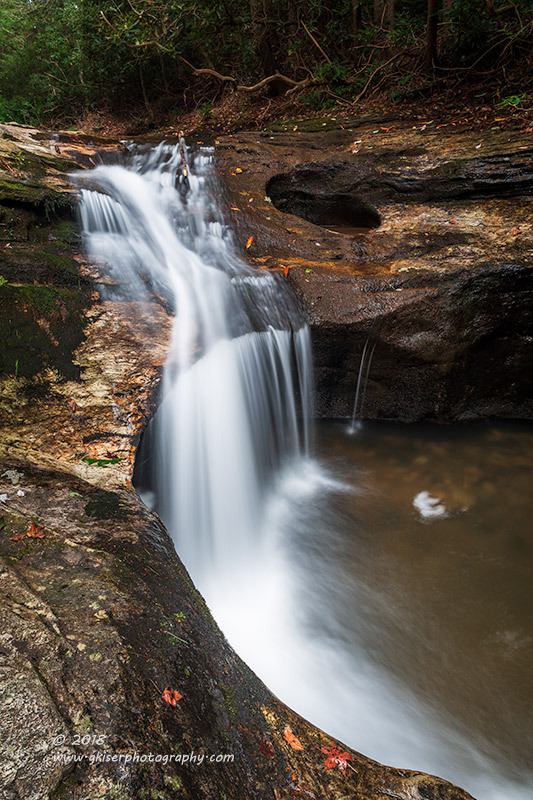 That allowed me to crop in closer to the rest of the waterfall and show more of its true character. I think I like this view better than my original opening image, although I do miss the rock as the foreground interest. While I was working on that half composition I decided that the exit of the waterfall deserved a little bit of attention on its own. I got in close with the 24-70mm lens and isolated what looked like a foot at the end of the waterfall. I was surprised that this hadn't spoken to me earlier. It photographed very well I thought and was one of the more simple scenes within the entire waterfall. At this point, more and more people were starting to join me. Considering I had used every lens in my inventory with the exception of the 14mm prime, I figured I was pretty well spent for compositions. I went ahead and packed up shop to begin the hike back to the truck. I left about a half dozen people at the base of the falls, and passed another 20-30 on the way out. Michael was right, even in a light rain, early on a Sunday morning, this park is packed out. My impromptu weekend was now over and it was time to make the drive home. In all, I had 330 frames shot with several HDR compositions and a panoramic composition. I ended up with 32 images that I felt were worth keeping. I have now completed the processing on them, and will work on getting a few of them in the gallery here before too long. OK, so to catch up here, this is the second part to a three part blog entry about a weekend in the mountains. This was my first full day, and my plan was to take advantage of the partial cloud cover and do some rural exploration. There are a lot of back roads in the mountains with barns and old cars just waiting to be photographed. The light that I was expecting was going to be pretty much perfect for this. When the alarm rang I checked the weather and found that there were going to be a bit more clouds in the area, and currently, the clouds were really low. I knew that sunrise wasn't going to be an option, so I set the alarm for another hour away which would get me up for the breakfast at the hotel. It seemed like only a few minutes, but 6am was here and it was time to get up and functioning. I was really glad that I had opted for a hotel rather than sleeping in the truck. I had slept all night, but was still tired. I finished up with breakfast and finished getting ready to head out. With the increased cloud cover I thought it might be a good time to get Elk River Falls which I had originally planned for Sunday. No reason to wait if the conditions were going to be decent today. That would also get me out in an area that I recall had some pretty nice rural settings. I could reasonably see myself spending the entire day in the area of Newland, and Elk Park, NC. I got my gear and off I went. The trip was pretty simple and I enjoyed the drive. The clouds were clearing, however, and that made me a little nervous about doing waterfall photography. 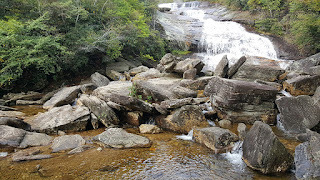 My first inclination was to abort Elk River Falls and concentrate on the rural settings. The more I thought about it though, something was pulling me to the waterfall. Despite the weather not really looking promising, my heart said to keep on going. I've learned to listen to these inner clues over the years because I usually get some of my best images when I follow their lead. I did know that there were compositions that could benefit from a bit of blue sky, and I was thinking that might just work with what I was seeing above. When I finally got to the parking area, there was one other car parked in the lot. I was hoping for none, but a single car was no big deal. I grabbed my gear and started down the short trail to the falls. The last time I was here was 10 years ago and honestly, I wasn't recognizing any of the trails. I barely recognized the parking lot. There was a short spur off of the main trail that took you to the top of the waterfall. You can file this under something that I didn't recall, so I decided to walk out to see if there was anything picture worthy up there. 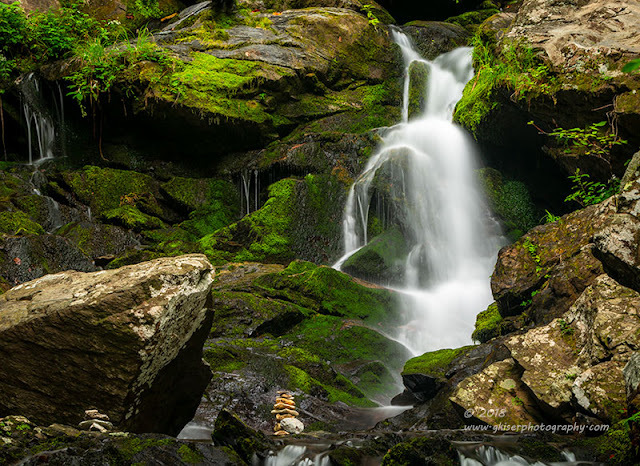 What I found was an impressive flow over the rocks, and lots of moss undertones to the water. The composition was interesting enough to pull the camera out and see what I could do with it. I fitted my 24-70mm lens along with the Singh-Ray Color Combo Polarizer before mounting to the tripod. I started to play with different compositions before I finally settled on the one that opens this entry. It wasn't anything special, but the quality of the water was just too good to pass up. What I really liked about how this shot worked out was it looked like an arm reaching out to the side as if to give an embrace. There was just something oddly human about this part of the waterfall, and it comforted me. This was ironic considering all of the signs posted about how dangerous it was at the top of the waterfall, and how dozens of victims had slipped and fallen to their deaths here. This is the sad part of doing waterfall photography. 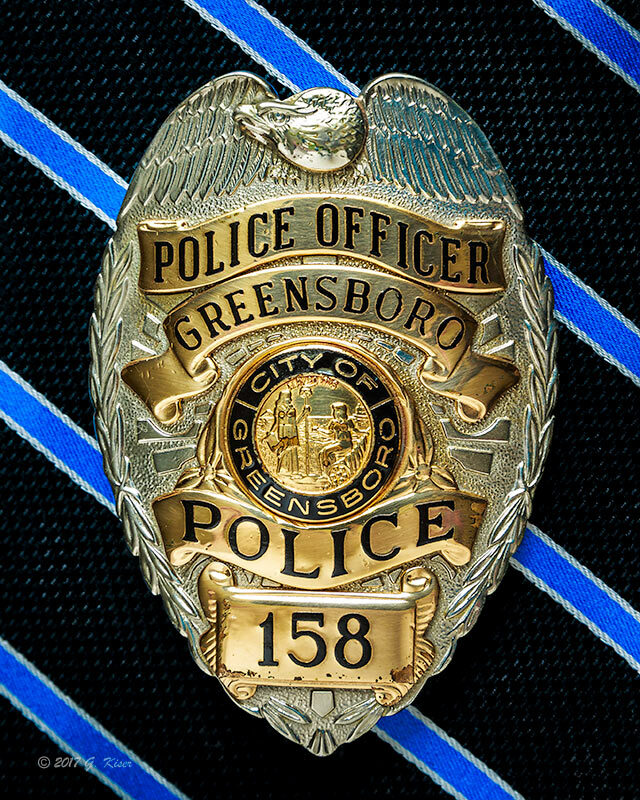 Just about everywhere I go, there have been deaths by people doing what I'm doing, or just simply being where I am. It is a sobering thought. Even though it was really pretty at the top of the waterfall, I was looking to get to the bottom of the falls and try some photographs of the main event. It looked as though there was nobody around, and that was a great surprise after seeing the car in the parking lot. It took no time at all before I got down to the bottom and started to walk over the long rock that acts as a bridge to the center of the pool. I saw a small jean jacket that belonged to child sitting on the rock that I guess had been left by visitors in the past. It had been out there for some time it appeared. I started to survey the scene to see what I could come up with. I started out with my 16-35mm lens, but wasn't really happy with what I was getting. I moved up to the 24-70mm lens with the Singh-Ray Polarizer and found a little bit better of a perspective. It still wasn't what I was wanting though. I was happy that there was a bit of blue in the sky directly above the falls which I have found is pretty mandatory if you are going to shoot a full on shot of this one. The sun was still covered by clouds to my left so I had a good exposure. Composition was what I was lacking. I decided to see if a panorama would work out, and started to put the elements together in my head. I left the current lens on, and flipped it on its side. I did a test pass and everything looked good. I ended up doing an eight shot series of the pool beneath the falls. The rocks in the water made for great bookends to the shot, and the bit of blue hung nicely over the falls. This was pretty good, but I didn't like the way the water was looking. The ripples and movement disrupted the scene a little bit, but not terribly. It did lead me to an idea though. I have been wanting to use my 10-Stop ND filter more, and I saw this as an opportunity to make that happen. I brought the 16-35mm lens back out since I had moved positions a bit. I started to play with compositions a little bit more and found one that I thought worked out nicely. I added my B+W Polarizer since it was a slim mount, and then screwed the Lee Filter holder onto that. I slid in the Singh-Ray Mor-Slo filter and looked through the viewfinder. It was pretty much black. I checked the live view, but it took adjusting my exposure greatly before I could see anything. Ten stops is a lot of light to lose! I worked out an exposure at 30 seconds and looked at the results. I was onto something, but the water still was too rough for my tastes. I shifted into Bulb mode and started working some longer exposures. I ultimately ended up with a three minute exposure at f/14 and ISO 100. Not only did that smooth out the water, it showed a good bit of movement in the clouds above which added to the drama of the scene. The rocks were dead still , so they appear to be sitting on top of ice. This was the image that I was wanting and hadn't even known I wanted it. By this time, there were people joining me at the bottom and what was worse, there were more walking around at the top of the falls. My serenity was over, and the compositions I was wanting had come to an end as well. I packed up carefully since I was kind of balancing everything on the spine of a rock. I worked my way through the crowds back to the parking lot. However, I decided to make one quick side trip. There was a set of rapids before the waterfall that had interested me when I was walking down. Not wanting to miss out on any good lighting for the main falls, I had skipped this location initially. Now was a great time to give it a try though. Looking at this section of water, I knew that I was going to be better off shooting isolations than an overall shot. I went ahead and fitted my 70-200mm lens and the Singh-Ray Polarizer. 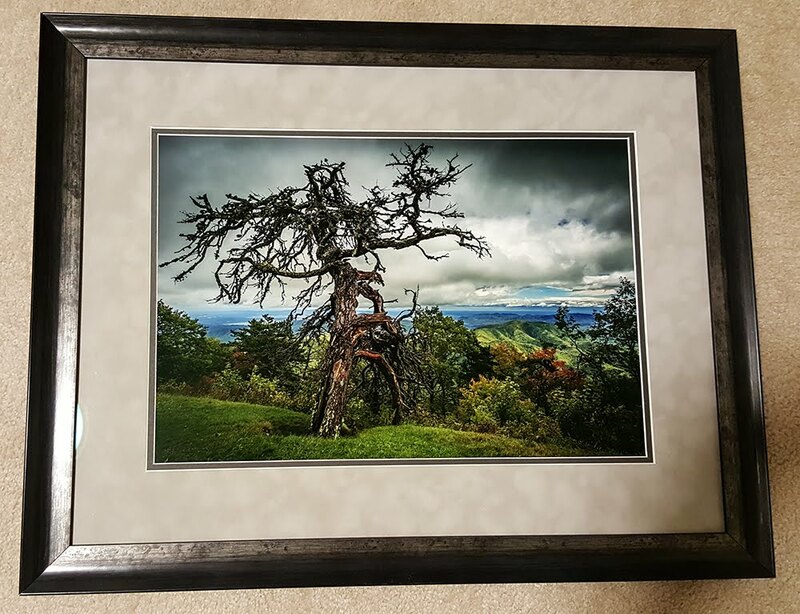 I started to frame up compositions, but wasn't getting the look I was after. I couldn't get any closer, so I decided I needed more reach. I grabbed my extender and added it between the lens and camera. There it was! I was seeing my ideas come into focus at this point. I started to pick out areas to isolate and cranked off about 10 different shots of the rapids. The one that I deemed the best needed one small tweak in post processing. I flipped it on its horizontal axis so that it flowed from left to right as we read. This made the image "read" much better than before. Within in a few minutes of arriving here, the sun was starting to get a little bright, and there were more and more people joining in on the trails. It was time to get gone. When I got back to the parking lot, it was packed with cars, and more were coming in. I loaded everything in the back of the truck and made room for somebody else. Man, I was glad I got there when I did because there would be no way I would have been able to shoot this location with all of the people that were showing up. Now the sun was out, and the clouds were sporadic at best. I figured I could possibly make it work if I was shooting rural scenes. I would just be very dependent on the direction of the sun to make my scenes work out. I started driving aimlessly around and looking for things to photograph. There were a lot of great subjects, but the nature of everything here caused there to be no room for the subject to breathe. Without a compelling composition or great lighting I was letting scene after scene go by. I even found myself wandering into Tennessee for about 30 minutes. I was starting to get discouraged and a little frustrated at my lack of luck hunting rust. On the other hand, I was noticing that the sky was starting to get a little more cloudy. It was time to head back to the Parkway and start looking for grand landscapes where I could capitalize on the developing sky. I keyed the Parkway into my GPS as I was hopelessly lost at this point. I got on the correct course and began moving in the right direction. My eye caught a side road that sparked my attention for some reason. I didn't see anything on it, but something made me turn left. Within 100 feet of entering the road I passed by one of the oddest shaped rocks in a lake that I have seen. It caught my eye, but I wasn't quite sure if I wanted to photograph it. I continued on to the end of the road where I found an awesome old Chevy truck, but it was sitting in the most unpicturesque location I could imagine. There was a chain link fence, power pole, and an aluminum building all right in front of the truck near the bumper. The house was to the rear of the truck, across the road. There was no angle to shoot it from. I got turned around and went back to the main road. I stopped at the rock in the lake one more time and decided that it was worth taking a few shots of. With the distance I was having to work from, I knew I would need my 70-200mm lens. Since I was wanting a reflection, I skipped the polarizer, and shot with nothing on the front of the lens. I tried several different compositions, and even tried the 10-Stop filter. Unfortunately, the trees were not still enough for that to work. The composition that I decided on ultimately was the one that had the double rock on the left, pointing to the the alcove in the lake. There was a grove of trees situated in the right hand side of the composition that were illuminated by the sun providing a great bit of focal lighting. The water was still enough to provide great reflections as well. Hey, that little voice that told me to turn left really paid off. See why I listen to that voice so often? 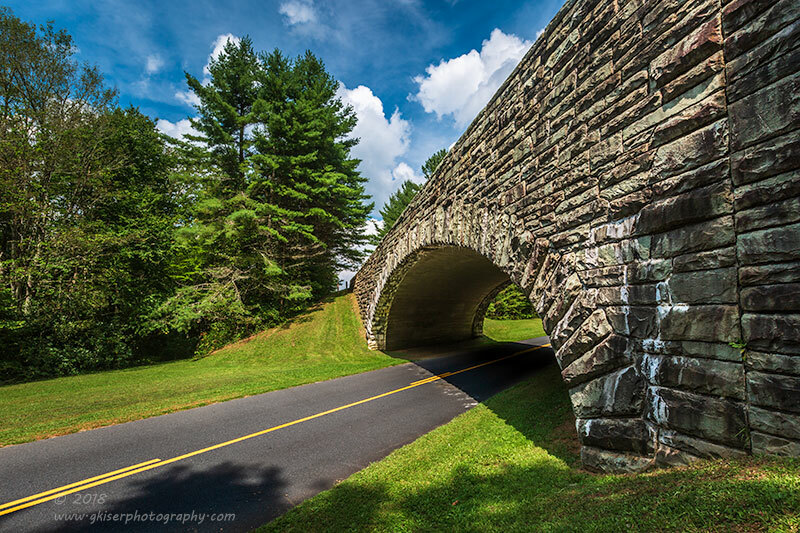 At this point, I was back in the mood to shoot landscapes and I was looking forward to getting back on the Parkway. I entered it at Hwy 221 and headed South towards Linville Falls since it had started to rain. The closer to the falls I got, the lighter the rain became. It actually started to clear up as I was passing the Hwy 181 bridge. I happened to look at the bridge and thought that the light was pretty good on the bridge. I pulled off on the side of the road and grabbed my gear. I had shot this bridge before and knew that the trick was a wide angle lens. I grabbed my 16-35mm lens and added the B+W polarizer so I wouldn't have any vignetting issues. I worked my way up the hill beside the bridge and worked out a composition that put an arch in the arch of the bridge. The actual roadway above was presented as a strong diagonal element that complimented the diagonal of the Blue Ridge Parkway. The trees made for a great balancing element. I started off shooting an HDR series just in case I wasn't able to get the exposure to work out. Then I started to shoot single shot exposures watching my histogram as I went. I even switched sides and shot from across the road. In the end, none of those images made the cut, and the HDR image that I had shot was also trashed in favor of this single image that I thought turned out really well. 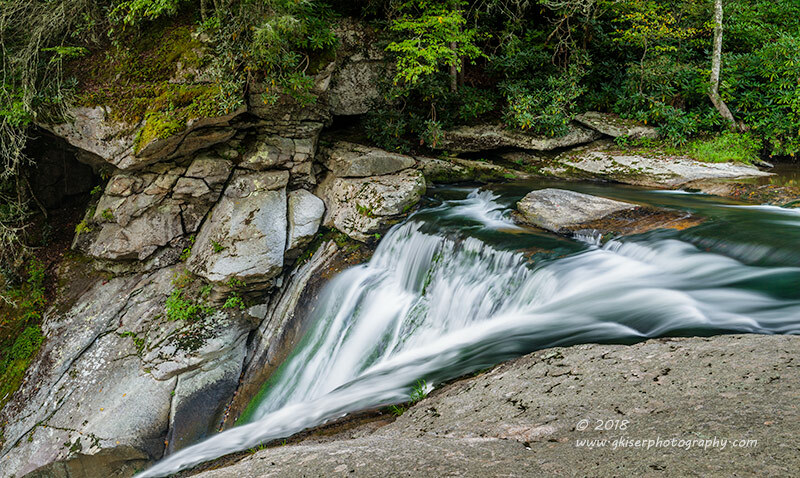 With the sun back out, I wasn't going to finish heading to Linville Falls as I was sure the parking lot was jammed with cars, and the sun would make it too bright to shoot any of the moving water. Instead, I decided to go back North to see what I could see. The clouds were looking really cool in certain areas of the sky, and I wanted to go somewhere to take advantage of them. The further North I went the more I started thinking about Thunder Hill. This is one of those overlooks that can be shot from all different directions with equal success. There are even areas near the overlook that work out as grand landscapes. That was to be my destination. When I arrived, I could see that the main overlook wasn't really that eye catching with the haze over the mountains in the distance. The back side of the overlook was looking spectacular. As an added bonus there were no people on that side. I parked the truck and grabbed my gear. 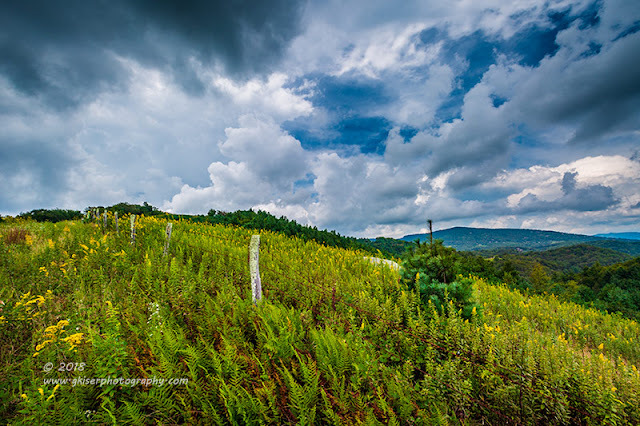 I decided to use the 16-35mm lens with the Singh-Ray Color Combo Polarizer for this series. I started to look for different compositions on the ridge. There was just so much to work with between the fence, the sky, and the goldenrods that were in abundance. The sky was awesome in just about every direction. I even managed a shot that included the Blue Ridge Parkway as it split the treeline over the ridge to the North. The fence had several sections with a lot of character which I enjoyed taking advantage of. I think that my enjoyment of the area was starting to draw attention. One by one, people started to show up on this side of the road. They would start walking down the MST trail through the field, or would walk along the ridge where I was shooting. For the most part nobody got in my way which was nice. I managed to keep the wide angle lens attached the entire time I was on the ridge. I thought about switching over to a different one, but I could really find no compositions that would have supported a different focal length than I was currently using. There was just so much that caught my eye, and I was really having a great time. The light did eventually start to fade, and I decided that I would go and find another location to shoot. This one was getting overgrown with people the longer I was there. There was even a portrait shoot going on near where I was shooting in the field. I was pretty sure that this was the same photographer I had seen during a sunrise a year or so ago. Funny how paths keep crossing for photographers. I continued North and finally came back to the location that I had started my weekend at just below the Mount Jefferson Overlook. The sky was looking really nice for the middle of the day. I decided that I would take advantage of the sky, from the opposite side of the road. There is another fence and a green gate just a bit further down and on the other side of the road. This was going to be my subject for the next little bit. I grabbed my gear and decided to go with my 16-35mm lens once again, along with the Singh-Ray Color Combo Polarizer. I got set up where I could include the fence and the gate as it hooked off into the distance. As I started to shoot, I realized that there was a car parked right where I had been the night before. It was in a position where it would be really hard to clone out, but I had no choice for the longest time. When he finally left, I celebrated by moving across the road and including the entire stretch of empty roadway. I was so happy that the road was finally clear, and I had the shot that I was after. Including the roadway really brought this image new life, and it turned out to be my favorite of this set, even though I was able to get my original composition shot with the car gone as well. The one thing that didn't set well with me was the fact that the road traveled from right to left in the frame. Since we read from left to right, I decided to flip the image so that it would read a bit better. The converging diagonals in the image were fantastic, and added a lot of drama. 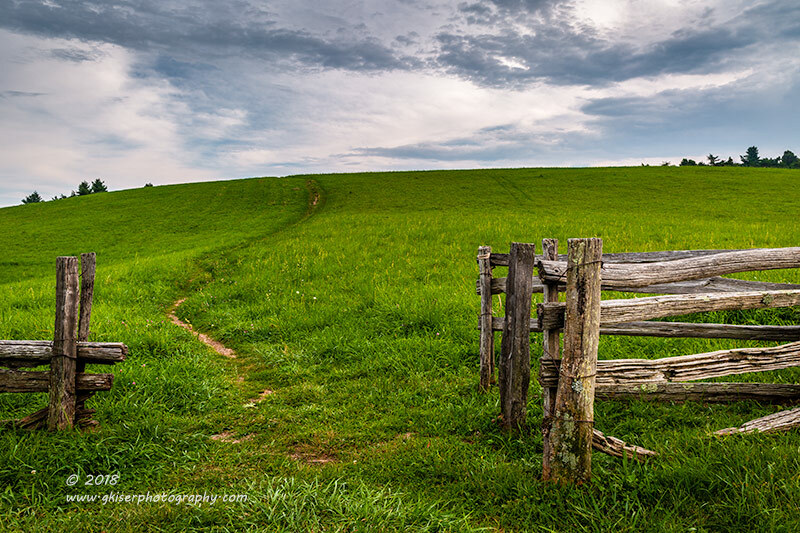 I was still able to include the green gate, and the semi bare tree in the field which I have always been drawn to. The pines in the distance really give the image a sense of depth as well. Oh yeah, and that sky!! Having worked this scene as much as I cared to, it was time to move on. I thought that the best option at this point was going to be the area of Doughton Park a bit further up the road. I had some ideas that might work well with the sky that I was seeing. 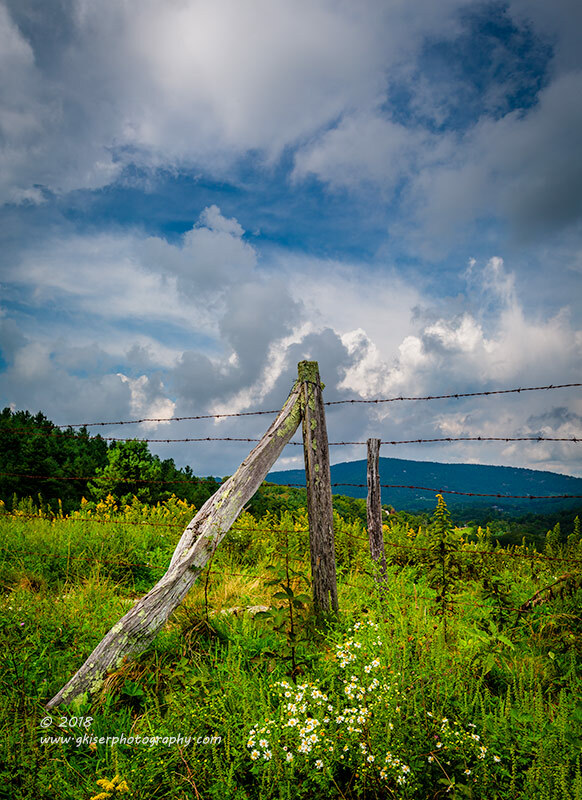 I was also looking forward to seeing the fences along the Parkway once you get into the park proper. I didn't find any fences along the Parkway that I wanted to photograph, but once I was inside the park, I found a lot of great subject matter. The goldenrods were out in full force, and the grasses in the meadow were starting to change color so I had all kinds of color contrasts to work with, not to mention the sky that was looking really nice above. The first shot that I tried was right next to where I parked. I grabbed my 24-70mm lens for this shot and added the Singh-Ray Color Combo Polarizer along with a 2-Stop Galen Rowell ND Grad. 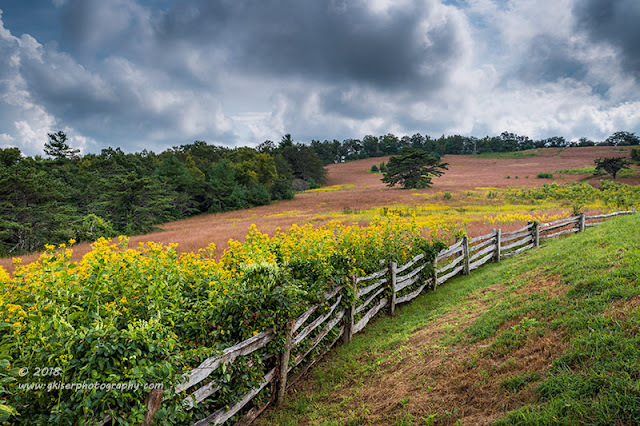 I really wanted to include the goldenrods with the fence so I was needing to stay elevated near the parking lot. 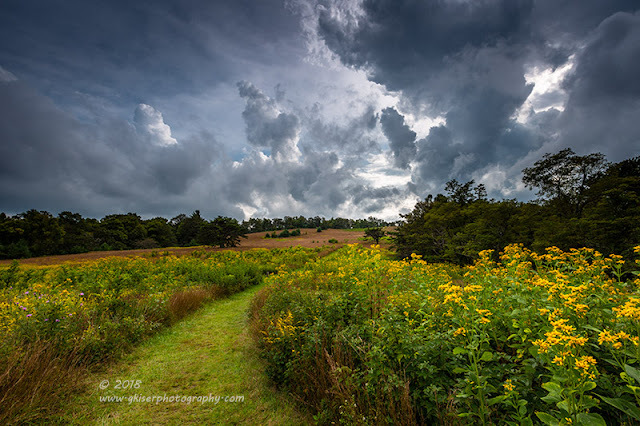 I set things up with a composition that had a nice diagonal line leading you into the scene, the different colors of the meadow as well as the sky above. I had just about everything that I could have wanted in a picture at this point. I did quite a few compositions on this theme until I was able to settle on this one here. I continued along the fence to the main meadow of Doughton. this has always been a source of fun for me to photograph. I have been here in all seasons and have always attempted a shot or two of this area each time. this time I had some different elements that I wanted to include. 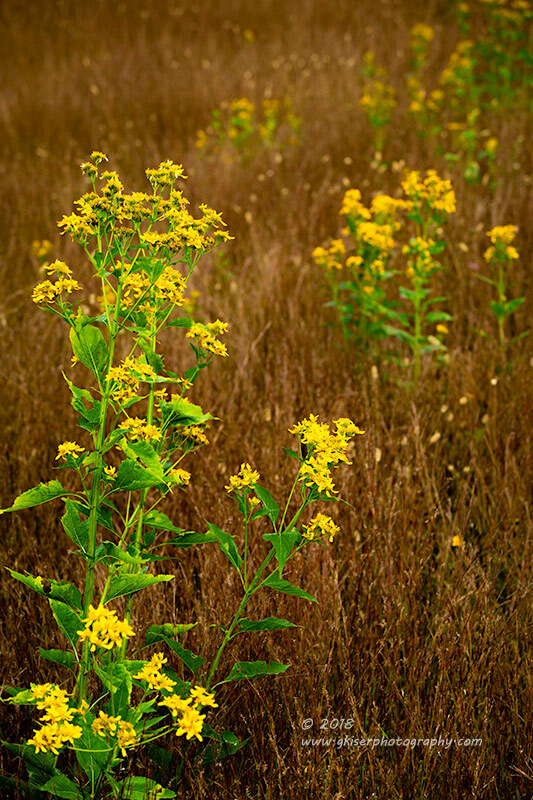 The goldenrods were quite prevalent among the browning grasses. The green tree stood out strongly in the field as well. I still had my 24-70mm lens attached, and it was just about perfect for the composition that I was wanting. 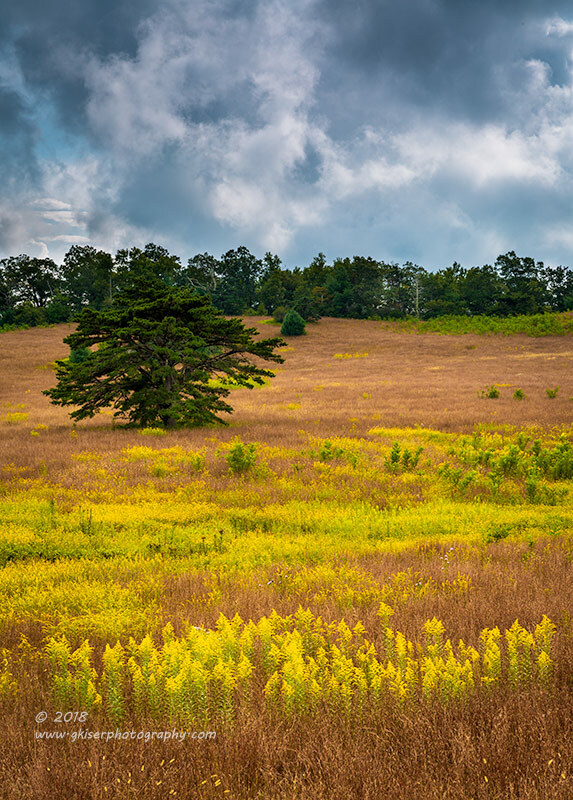 I framed a nice tight shot with the goldenrods as the foreground interest. The sky was looking really good with the benefit of the ND Grad I was using. The trick was to wait for the wind to stop long enough to make the exposure with the flowers relatively still. It happened occasionally, but patience sure was a necessary thing for this composition. The more I looked at the field, the more I was really engrossed by the colors of the grasses and goldenrods. I decided that I would do an abstract piece highlighting these elements. I needed to get in much tighter than the current lens would allow. I swapped it out for my 70-200mm, to which I added the Singh-Ray Color Combo Polarizer. From here, I started framing patterns in the field that caught my eye. These are not really my typical shot, but it was fun to work outside of my normal box for a bit. 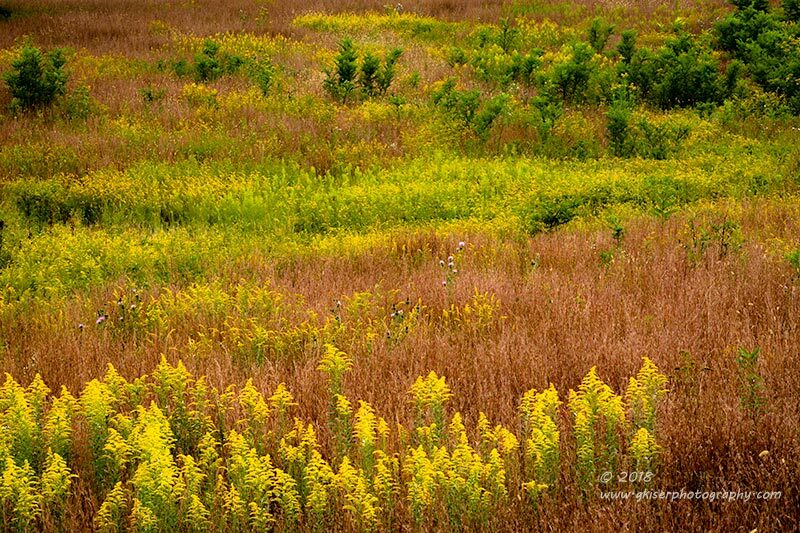 In some cases I was able to get in really close to the goldenrods and really get them highlighted in the frame. Using limited depth of field helps these to stand out from the background. An added benefit is that the shutter speed gets quicker with the opened aperture so the wind was less of an issue for these shots. I really wasn't sure how these would turn out, but I figured that it was a photo weekend and digital images were free...might as well give it a whirl huh? I thought that before I left I would go and get some pictures of the trail through the meadow. 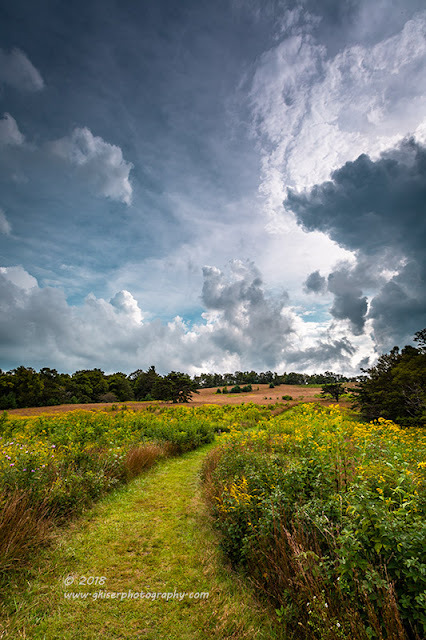 Since the grasses were really high, there should be some good compositions to be had on the trail, especially if the sky held. I walked down to the opening in the fence and looked to see what kind of compositions I could find. As I was looking, the sky started to change in a very dramatic way. These clouds that were rolling in were incredible. I had to photograph these, and I had to do it quickly! I had to think quick, and my instincts were telling me to grab my 16-35mm lens and my stack of ND Grads. Since I was shooting into the sun, there wasn't much need in a polarizer, plus that just slowed the process down when working with the Grads. I got the camera built and added a Singh-Ray 3-Stop Galen Rowell ND Grad to control the exposure of the sky. I started taking composition after composition. Each shot was delayed as I waited for the wind to die down a bit since I was so close to the goldenrods. The trail was amazing as a leading line through the scene, and the LCD review images were looking so promising. The sky and the lighting kept changing minute by minute. I ended up with two exposures made during the peak of the drama. I got a landscape as well as portrait of basically the same sky. While both are very similar, I have chosen to keep them both because one shows the drama in the sky, while the other shows the magnitude of what was going on in the sky. In both cases, the trail leads your eyes through the image. The clouds provide a background that pulls you deep within the frame. These conditions lasted for about 10 minutes and then the clouds lost their drama. Finding myself under "normal" skies once again I thought that I needed to find a place for sunset. I had about two hours before that happened. I got everything loaded back up in the truck and grabbed a little snack before heading out in search of my next location. 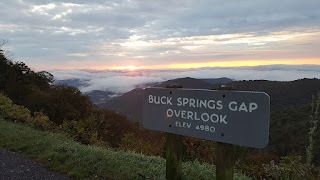 With the day coming to a close, I decided that it might be in my best interests to start heading back in the direction of Blowing Rock and the hotel. I ended up stopping a short distance from where I had been at the Alligator Back Overlook which was just on the other side of the meadow I had been shooting minutes before. I had shot this section of the Blue Ridge Parkway last year and figured that the composition would work at sunset as well. The clouds were decent, but time would tell if there would be any color in them come sunset. I got out of the truck and walked around looking to see if there were any alternative compositions that I could use. I found a couple of ideas, but as I was looking, the clouds were starting to actually fade away to just a hazy sky. This wasn't going to work. I decided to get back in the truck and head back South. If something developed on the way, so be it. I was tired and needed to get to the hotel sooner rather than later. As I was driving, I started to think about an image that I had seen of the Lump Overlook several months ago. It was a minimalist image, and one that has haunted me since. With the sky starting to look somewhat interesting again, I decided to give it a try. 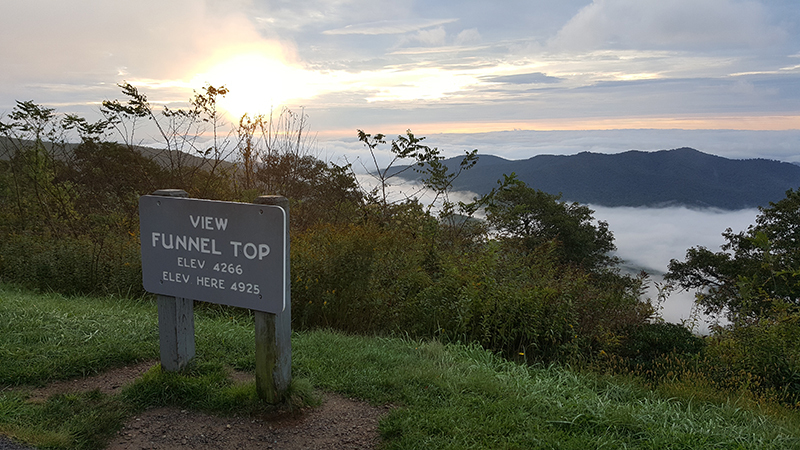 I stopped at the Lump Overlook and saw that the clouds over the hill were looking pretty nice. As an added benefit, the sky to the West was looking very promising as well. I got out and grabbed my gear. I wanted to start with the minimalist shot first. For this one, I attached my 24-70mm lens along with the Singh-Ray Color Combo Polarizer so that I could get as much definition out of the clouds as possible. You see a polarizer works better when the sun is at 90 degrees from the angle of the shot, and I was shooting due South. I got down low and started to frame my shot. I couldn't remember how the inspiration image went, but that wasn't important. What I needed from that image was the inspiration to create an image of my own. I loved the fence, and wanted to include that. The trail snaked its way through the grass, but didn't have the benefit of overgrown grass as I had seen at Doughton. I shot several different versions of this scene over the course of about 20-30 minutes. Each shot was composed differently, and had a different feel to it. They all stayed with a minimalist theme though. I was keeping a constant eye over my right shoulder to see when it would be time to play with the sunset. That time came about 45 minutes before sunset. It was time to get the camera set up slightly different for a new composition. 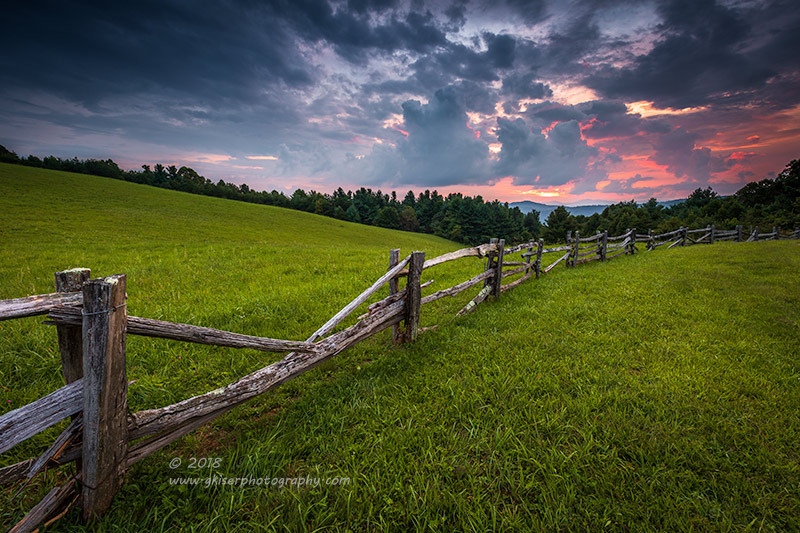 I chose to go with my 16-35mm lens so that I could really emphasize the fence as a leading line. I picked out my location and started to frame up the shot. I quickly realized that exposure difference was just too much for the camera to handle. I grabbed a Singh Ray 3-Stop Galen Rowell ND Grad and slid it into the Lee Holder. It was looking better, but still wasn't quite right. I then added an additional 2-Stop Grad for a total of 5 stops of light reduction in the sky. Check out the video I shot showing how this works. As you can see, I was starting to get hopeful about the sunset. The clouds were really dramatic, and I was envisioning the sky exploding with color just before sunset. Well, it didn't quite work out that way. But....my patience did allow me to see a bit of color in the sky after the clouds moved in and covered the sun. There was apparently a small slit in the clouds right at the horizon. At 7:40 (2 minutes before official sunset), the sun found its way through the clouds for one last hurrah of the day. It wasn't a glorious sunset, but I had a composition I really liked, and I was hoping that something was going to happen even though the sun had slipped behind the clouds. I did get a bit of color, and I was quite happy about that. Sometimes subtle color can be just as effective as an impressive showing. Regardless, at this point, I had gotten what I had come to get. It was time to head back to the room and get a shower. Ahhh yes, I was so happy that I had opted for a room. At this point, I started to look at my plans for Sunday. 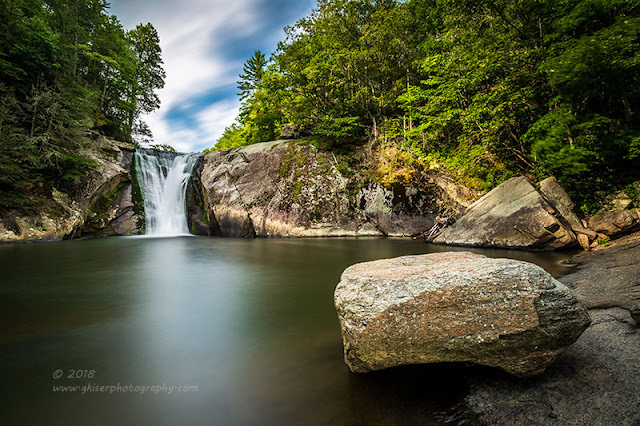 Since I had shot Elk River Falls this morning, that left me with Catawba Falls to shoot. The weather was still looking great for those with a chance of storms around 8am and then mostly cloudy skies for the rest of the day. It was nearly perfect lighting conditions for waterfall photography. I figured that I would get up, eat breakfast and be on the road in time to get to the falls between 8-9am. Michael had told me that I needed to get there early to beat the crowds. I was hoping that the threat of rain would keep everyone away. Time would tell if that was a reasonable theory. For now, it was time to go to bed.